Like its bigger sibling, the little Pro is tough to repair but has beefy internals. The 9.7-inch iPad Pro isn’t simply a scaled down version of its larger predecessor, according to a closer inspection of the tablet’s internals from the folks at iFixit. First thing’s first: Like all iOS devices, the smaller iPad Pro isn’t easy to repair, so if you’re a DIY-er, this tablet isn’t the one you’re looking for. There are a few big differences between the large and small Pros. The 12.9-inch model scored a little higher on iFixit’s repairability scale because its larger battery has pull tabs for easier removal, which the smaller Pro’s does not. The big Pro also has four giant speakers that take up a good chunk of its internal space. The 9.7-inch model doesn’t have the real estate to devote to audio, though it also has a quad-speaker setup—they’re just squeezed at the margins instead of given room to breathe. iFixit also confirmed that the smaller Pro has 2GB of RAM courtesy of Samsung, while the more powerful of Pro is rocking 4GB of RAM. Both iPads have the first-gen Touch ID, not the speedier second-gen version you’ll find in the iPhone 6s. Get a load of that bump, courtesy of a 12-megapixel camera. The little Pro also has a slight camera bump, similar to the iPhone 6s Plus, which you won’t see in the 12.9-inch model. 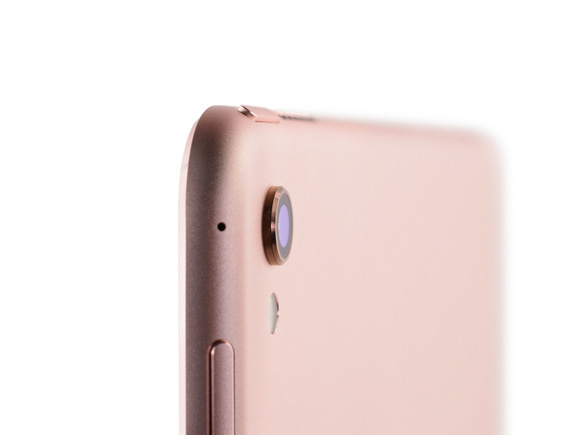 That bump is due to a 12-megapixel rear-facing camera with 4K shooting capability, just like the iPhone camera. The 12.9-inch Pro comes with an 8-megapixel camera that can shoot 1080p video, so this is a definite upgrade. There are some similarities between the Pro models: a virtually unrepairable Smart Connector, a fused front panel, and tons of adhesive everywhere. There are few surprises in the iFixit teardown, but if you love to geek out over internal components, head on over for a step-by-step teardown of the little Pro, which starts at $US599 at the Apple Store.